Kim Kardashian just gave birth to her new baby boy Saint West, with her husband Kanye at her side. However, according to Life & Style, Kimye had a major meltdown and Kanye supposedly dumped her right before their son was born. It looks like Kanye West and Kim Kardashian worked out their issues – seeing as how they took Saint home together. But, L&S teases that Kim is still not happy, because Kanye is about to jet off again and has a ton of upcoming gigs scheduled – leaving her home alone with a newborn baby and their toddler North West. Kim and Kanye aren’t the only relationship in trouble right around the holidays. Kourtney recently took back her sober (for the umpteenth time) baby-daddy Scott Disick – but her mother Kris Jenner is enabling him already and basically begging him to relapse, for the sake of ratings. Apparently, Kris Jenner booked her son-in-law Scott a gig at 1OAK, hosting a wild New Year’s Eve party, and Kourtney is LIVID. 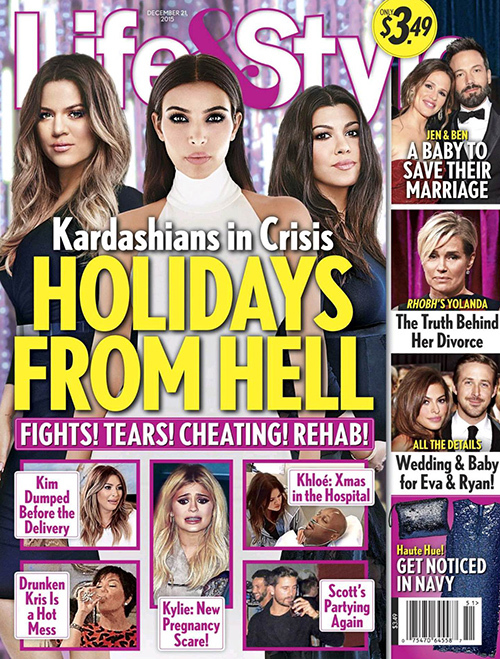 Kourtney isn’t the only one who is not on speaking terms with Kris right now, Life & Style Magazine also teases that the Kardashians can expect a major blow-up if they try to put Caitlyn and Kris in the same room during the holidays. Kylie Jenner and her boyfriend Tyga bring enough drama to the table that there is hardly any room for anyone else’s problems. On top of their recent break-ups and make-ups, L&S is reporting that the couple had a huge pregnancy scare on Thanksgiving and Kylie had to skip out on the turkey and go take a pregnancy test. Meanwhile, Kendall Jenner is trying to get as far away from her crazy family as possible – she is putting some major distance between herself and the Kardashian-Jenner clan and will most likely spend the holidays with her clique of girls. Do you think that this will be the worst holiday yet for the Kardashians? Who do you think will snap first? Will their relationships still be in tact by the time we reign in the New Year? Let us know what you think in the comments below!